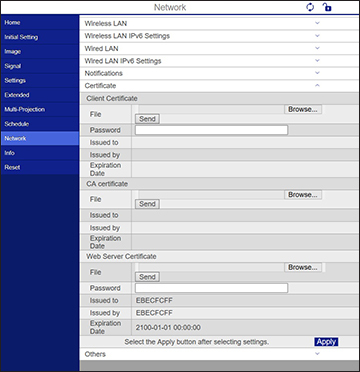 You can register the digital certificates on the projector for wireless LAN authentication. Make sure your digital certificate file is compatible with projector registration. Start your web browser on a computer or mobile device connected to the network. Type the projector's IP address into the browser's address box and press the computer's Enter key. You see the Web Control screen and a prompt to enter a user ID and password. Click the Choose File button, select the certificate file, and click Open. When you finish registering the certificate, click Apply to finalize your changes and complete the registration.